The Pops Gustav Archive: Truth, Justice and the Fanatical Way part 4: MOC or not MOC? Truth, Justice and the Fanatical Way part 4: MOC or not MOC? With Superman Returns mere weeks away, the Hype Machine is in overdrive, and that includes a flood of merchandise. The red and yellow (excuse me, maroon and gold) S-pentangle is emblazoned on everything from a “Heat Vision Headset ” to Kryptonite flavored (ew) Doritos. For fanboys, the vast majority of whom are collectors, the problem now arises... just how much of this crap does one buy?? The problem with blockbuster movie tie-ins is that they’re ubiquitous. As with Star Wars, Batman, Harry Potter, and (right now) Cars, the stuff is everywhere; You can’t escape it. Warner Bros. has Superman Returns licensing deals with Mattel, Pepsi, Burger King, Duracell, Samsung, EA Games and Quaker State Motor Oil, to name a few. The reason is not to extract every last penny out of collectors, but to burn the movie into the consciousness of every potential ticket buyer. It’s publicity carpet bombing. While there are some fanatical collectors who “have to” buy every single item that ties in to their particular obsession (in this case, Superman), most will pick and choose, using whatever subjective criteria fits their esthetic (and their wallet). Adding to the resistance to superhero movie merch is the sheer quantity of it. After all, collectibles by definition need to be scarce, and as 1989’s Batman taught us, ubiquity breeds contempt. While Bat-crap sold like crazy upon that film’s release, almost every so-called “collectible” from that film has aged not like cottage cheese rather than fine wine. Nobody wants the stuff. Myself, I usually don’t buy movie merch, but again, we’re talkin’ Superman here, and that’s a different story. My Superman collection includes comics, books, videos, toys, posters, music, and most of all, action figures. Currently, I’ve got 91 different Superman figures sitting on shelves in my living room. That number includes three Clark Kent figures, but doesn’t include the Superman villains nor other members of what’s called the “Superman family” (or the few doubles I have stashed away as backups). If I were to add those in there, the total would go well over a hundred. Of those, just three are from Superman Returns, despite there being over two dozen different action figures tying into the new movie, including “Super Breath Superman” and “Truck Lifting Superman.” Buying them all would be a bit too expensive, but more importantly, since movie-based figures are almost always slight variations on the same design, really superfluous. 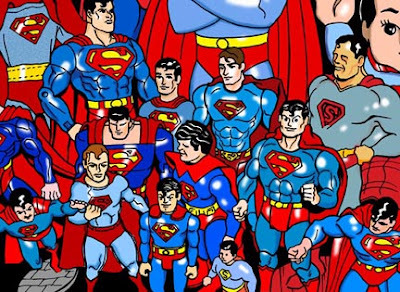 That may sound hypocritical from someone with almost a hundred replicas of one character, but all those different figures represent not only many different versions of Superman, but different stages of my life. A pressed wood figure from the 1940s was one of my first figures. The cloth-garbed Mego figure from the 1970s is a true vestige of my childhood, just as the 1980s Kenner Super Powers figure represents my late teens. The barrel-chested Justice League figure and many DC Direct variations are very much products of today’s world where adults with disposable income have become the biggest market for what were once just children’s toys. Collectors, especially those of the action figure bent fall into two categories: MOC and Not-MOC. For those of you who’ve never set foot in a comic store, the anagram stands for “Mint on Card” (MIB, or “Mint in Box” is a variation). It’s when you buy a toy (usually an action figure) and never remove it from its packaging. Sometimes it’s to preserve the value of the item. For instance, you can score a Mego Superman from 1974 for about twenty bucks (depending on condition) on eBay... but if that same figure is still in the original box, you’re gonna pay upwards of $250. It’s amusing to think of fanboys who are parents trying to explain to their five year old kid why Daddy doesn’t wanna take his “Superman Returns Disc Attack Superman ” out of the package and fire those orange plastic circles out of Superman’s chest (hmm... don’t remember that power). And therein lies the dark secret of the action figure collector. Yes, the sculpts are sometimes worthy of being called art. Yes, sometimes a figure can come to be worth hundreds of dollars. Yes, they are pop culture time capsules. But there’s probably not one fanboy who hasn’t at least once posed an action figure in a flying position and spun around making a swooshing sound. It’s a primal male instinct as hard to resist as playing air guitar to AC/DC.